Assessment of forest carbon (C) stock and sequestration and the influence of forest harvesting and climatic variations are important issues in global forest ecology. Quantitative studies of the C balance of tropical forests, such as those in Papua New Guinea (PNG), are also required for forest-based climate change mitigation initiatives. 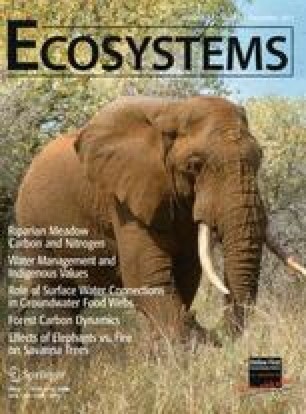 We develop a hierarchical Bayesian model (HBM) of aboveground forest C stock and sequestration in primary, selectively harvested, and El Niño Southern Oscillation (ENSO)-effected lowland tropical forest from 15 years of Permanent Sample Plot (PSP) census data for PNG consisting of 121 plots in selectively harvested forest, and 35 plots in primary forest. Model parameters indicated: C stock in aboveground live biomass (AGLB) of 137 ± 9 (95% confidence interval (CI)) MgC ha−1 in primary forest, compared with 62 ± 18 MgC ha−1 for selectively harvested forest (55% difference); C sequestration in primary forest of 0.23 ± 1.70 MgC ha−1 y−1, which was lower than in selectively harvested forest, 1.12 ± 3.41 MgC ha−1 y−1; ENSO-induced fire resulted in significant C emissions (−6.87 ± 3.94 MgC ha−1 y−1). High variability between PSPs in C stock and C sequestration rates necessitated random plot effects for both stock and sequestration. The HBM approach allowed inclusion of hierarchical autocorrelation, providing valid CIs on model parameters and efficient estimation. The HBM model has provided quantitative insights on the C balance of PNG’s forests that can be used as inputs for climate change mitigation initiatives. Julian C. Fox performed research, analyzed data, and wrote the paper. Ghislain Vieilledent contributed new methods and models, analyzed data and contributed to writing of the paper. Rodney J. Keenan conceived of the study and contributed to writing of the paper. Cossey K. Yosi and Joe N. Pokana were responsible for data collection, data analysis, and contributed to writing of the paper. Many people from PNGFRI have been instrumental in establishing and maintaining the PSP network. Forova Oavika, Cossey Yosi, Joe Pokana and Kunsey Lavong have managed PSP establishment and remeasurement over the last 15 years. Janet Sabub has provided secretarial and data entry services. Field assistants were Stanley Maine, Timothy Urahau, Matrus Peter, Amos Basenke, Gabriel Mambo, Silver Masbong, Dingko Sinawi and Steven Mathew. We thank Heidi Zimmer for comments and advice. This study received financial support from the Australian Centre for International Agricultural Research (project FST/2004/061). C. Yosi is supported by an ACIAR John Allwright Fellowship whilst undertaking PhD studies at The University of Melbourne. UNFCCC (United Nations framework Convention on Climate Change) 2010. Draft decision CP/16, Outcome of the work of the ad hoc working group on long-term cooperative action under the convention, UNFCCC, Bonn, Germany. Available from http://unfccc.int/files/meetings/cop_16/application/pdf/cop16_lca.pdf. VCS. 2008. Tool for AFOLU methodological issues. www.v-c-s.org/afl.html.